Where do I use my Sofa.com voucher code? You can find a huge array of sofas at Sofa.com, all of which have been designed and handcrafted by Sofa.com themselves. Shop by type and discover sofas, corner sofas, sofa beds, chaise longues, loveseats, breakdownables, 2 seat sofas, 2 and a half seat sofas, 3 seat sofas, 4 seat sofas and day beds. Shop by style and discover an array of different sofas and chairs including classic/ traditional, contemporary, mid-century, on legs, round arms, square arms, leather, fabric, velvet and linen. You can also shop by size and discover large sofas, small sofas, large corner sofas, small corner sofas, small sofa beds and large sofa beds. If you’re shopping for beds you can discover ottoman beds, guest beds, headboards, beds in boxes, single beds, double beds, king sized beds, super king beds, bed bases and valances. You can also browse through a wide range of accessories including mattresses, scatter cushions, storage benches and accent chairs which you can pair with your bed to create the ideal sleeping space. And, that’s not all. Sofa.com also allows you to create your own personalised sofa by selecting your ideal fabrics, colours and cushions. Choose from 100s of designs and fabrics and they’ll make a sofa or chair especially for you that will not only be beautifully stylish but made to last too. In fact, Sofa.com are so sure your product will last, they offer a lifetime guarantee on all their solid wood frames. Sofa.com provide a personal shopping service in each one of their showrooms. If you’d like help or advice on choosing your perfect sofa, why not book an appointment with one of the expert personal shoppers? These consultations are absolutely free and enable Sofa.com to give you one-on-one guidance to ensure your shopping experience is as enjoyable as possible. The personal shopping service is customers’ favourite way to shop and, as a result, appointments get booked up quickly, so make sure you book as soon as possible. And bear in mind, the more notice you can give, the easier it will be for Sofa.com to accommodate you. Sofa.com stock a huge array of accessories including mattresses, scatter cushions, accent chairs, footstools, storage benches, a children’s collection, dining accessories, mirrors, rugs, pet beds and accent tables. All of the accessories available at Sofa.com are extremely stylish and affordable, made to complement your sofas, chairs and beds and to add a little something extra to your home. Discover discounted sofas, beds and home accessories in the Sofa.com offers section and update your interiors with a look you love. With savings across the entire collection of upholstered furniture and head-turning home accessories, that’ll add a stylish touch to any room in your home, you can fill your basket with an array of stylish products that’ll look great in your home. There are tons of great savings to be had in the offers section, you can save 10% off in the flash sale, enjoy 40% off ex-display items and 20% off selected fabrics. All the deals and discounts in this section change regularly, so if you can’t find a price reduction on something you want, simply check back another time for new ways to save money. Delivery is free for all mainland UK addresses. If you live in Northern Ireland or the Republic of Ireland, give the customer care team a call and they’ll be able to talk you through your delivery options. If for any reason you wish to return your order, Sofa.com are happy to provide a full refund or exchange. Simply contact them within 14 days of your delivery date and they’ll come and collect it at a time that’s convenient for you. All they ask is that your item is in the same condition as it was when it was delivered. Please select your local showroom from the list of options available. You’ll then be taken to another page where you’ll find the opening times of your local showroom. 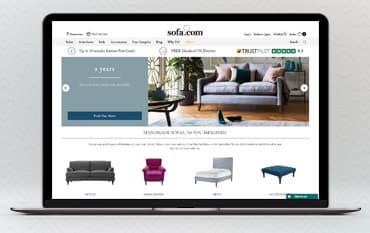 Sofa.com are a retailer of sofas, armchairs, beds and accessories, who’ve been handcrafting and delivering their wide selection of products for over a decade. The unique designs at Sofa.com are developed and brought to you by an innovative product and merchandising team, then built to last by skilled craftsmen in the Sofa.com workshop and are then delivered within 4-6 weeks by extra-careful drivers, who’ll even set up your delivery and clean up after themselves when they leave. Shop online at Sofa.com with a discount code from us and save money on your completely unique, handcrafted sofa, chair or bed that are guaranteed to last a lifetime.